This weeks message is the 6th in the series titled Who is Jesus? Today, we'll see that Jesus is the Lamb of God who paid for sin with his life and suffered silently when he was scorned. We see how we can die to sin and live for righteousness because of Jesus’s sacrifice. Affliction is a tough thing. We don’t like affliction. We don’t want trouble. We just want things to go nice and smoothly. But we also know that suffering is a part of life. A part that we don’t like, but a part that we can’t always avoid. Sometimes things happen. Sometimes we do things we shouldn’t have done, and it gets blown out of proportion. Sometimes other people do things, oblivious to the effects on those around them. And sometimes we get hurt, and suffering comes. But there is often a purpose for our suffering. We can often learn something when we stop and reflect about our experience. In Psalm 119, the psalmist is singing praises for God’s law, and just before we come to the passage I quoted above, he shares a little about a time that he was afflicted. He doesn’t give details about it, we don’t know what happened, but we get a glimpse in verse 69, “the arrogant have smeared me with lies.” And we’ve all learned the hard way, the lies of people who don’t fully understand our situation can cause a lot of our suffering. But the Psalmist seems to know why this happened. Verse 65 says, “Before I was afflicted, I went astray.” He seems to be giving us a cause and effect. He was afflicted because he went astray. He continued in verse 65, “But now I obey your word.” In his affliction, he turned back to God. And when it was over there were lessons that stood out for him. 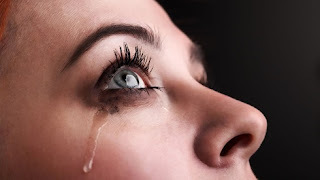 The first we see in verse 68, “You are good, and what you do is good, teach me your decrees.” He learned that God is good, and even when He allows suffering in our lives, He is still good. And even our suffering can be good, because God often uses it to teach us His ways. The second thing he learned we saw above (in verse 71). “It was good for me to be afflicted so that I might learn your decrees.” He may have gone astray, but when the struggles came, and he turned back to God, he saw that it was all worthwhile. He was convicted of going astray, and returned to God’s Word, and in the end, he found that he had learned something about God through that hard time. Something else to consider when afflictions come. Sometimes the suffering we feel doesn’t have anything to do with us. Sometimes we get caught up in the suffering of others, and it not about us at all. Sometimes we take things way to personally, that weren’t meant for us at all. Perhaps in those times the lesson is about pride or arrogance, and they come as a reminder that it’s not all about us, that we’re really a lot smaller than we might appear. So to wrap it up… There are seasons when we all suffer. Seasons that sometimes seem like they’ll never end – but they will. Seasons that seem so senseless – but we can learn from them. We can learn that God is always good, even when He allows bad things to come. And we can learn that in turning back to God, it will all be worth it. And we can spend some time reflecting on what happened, and what lesson God might have for us personally. Sermons from Waverly First Baptist Church, Waverly, NY. This is week five of our series, "Who is Jesus?" This week we see that Jesus is the Surrendered. We'll see a time when Jesus struggled to be surrendered, and we'll discuss how hard it often is for us, too. But ultimately, we'll see that without surrender, we'll never really belong to Jesus. Here is the message from Sunday, March 17. This is the 4th in our series titled "Who Is Jesus?" This week we see that Jesus is the Anointed One. We'll see when it was that Jesus was anointed, why He was anointed, and what it means for us. Here is the message from Sunday, March 10. This is the 3 of our series titled "Who Is Jesus?" Today we see that Jesus is the capstone. We'll see what a capstone is, why Jesus is like a capstone, and what it means for us. Lenten Lunches - Statements from the cross. Today we started our Lenten Lunches at Waverly First Baptist Church. We are getting together at noon each Wednesday during Lent for a soup and sandwich lunch, and short devotion. Our theme for our devotions is the Statements From the Cross. We will be having a different speaker for each week, and today I kicked things off with a devotion on this passage, "Father, forgive them, for they know not what they do..."
In Greg Laurie’s book, Finding Hope in the Last Words of Jesus, he tells a story about Richard Versalle. Versalle was an opera tenor in the New York City Metropolitan Opera. During a performance at the Lincoln Center in New York City, he climbed up on a ladder for a scene and he sang the words, “Too bad you can only live so long.” At that very moment, he fell ten feet off the ladder onto the stage floor, and died on the spot. There was no way he could have known that his last words would be “Too bad you can only live so long.” Ironic, isn’t it? In every life, there will come an end. We will all have a last meal. We will all take a last breath. And we will all give a last statement. Some of us will know what that last statement will be. But for many of us, the end may come quickly, and we won’t know. No one really knows with any certainty when the end will come. Yet so often our last words can mean so much. During our Lenten Lunches, our theme will be, Statements from the Cross. Over the next several weeks we’ll be looking at the final words of Jesus, the seven statements that He made from the cross, statements He made knowing His life was about to end. I think we will find them consistent with the way He lived His life. And I think these seven statements will tend to summarize his message to us. We read the first of these statements today. “Father, Forgive them, for they do not know what they are doing.” That’s a prayer, isn’t it. The fact that Jesus’ first words from the cross were in the form of a prayer, doesn’t really surprise us, does it? Jesus was a man of prayer, He often taught the importance of prayer in a Christian’s life. And let’s face it, even people who never pray, might pray in a life or death situation, facing an emergency. So the fact He prayed isn’t surprising. But is this what you might have expected him to pray? I don’t know about you, but I might have prayed, “Father, help me!” Or maybe one of his later statements first, “My God, My God, Why have your forsaken me?” But knowing Jesus like we do, perhaps this was fitting. He didn’t pray for His loved ones, or for His friends. He prayed for His enemies. In the Sermon on the Mount, in Matthew 5:44, He taught, “Love your enemies and pray for those who persecute you.” Jesus had once told Peter to forgive others seventy times seven times. Jesus was doing exactly what He taught others to do. He was forgiving His enemies. 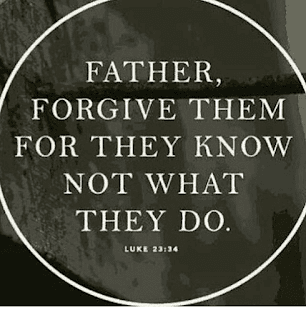 We can better see the importance of forgiving our enemies, knowing that Jesus forgive His. I think this also shows us that no one is beyond the reach of prayer. Jesus is actually praying for the very people who had whipped Him, beaten Him, and crucified Him. Talk about loving your enemies! You might think he would have been filled with hatred toward these people, despising them for what they were doing. Yet, he prayed for their forgiveness. You may know someone who you can’t even imagine ever coming to church, ever believing in Jesus. You may have an enemy that has wronged you, and you think that in eternity, God will pay them back. Jesus’ message to us is to pray for that person, no matter how hopeless it may look. Pray for that person. Pray for those who have wronged you, for those who have hurt you. And don’t give up praying for them. Perhaps this prayer also shows that Jesus recognized the incredible weight of their sin, even if they didn’t. He so often looked out over the crowds and was filled with compassion. Even from the cross, He looked out over the people, people who had beat Him, whipped him, and hung Him on this cross to die, and He was filled with compassion for them. 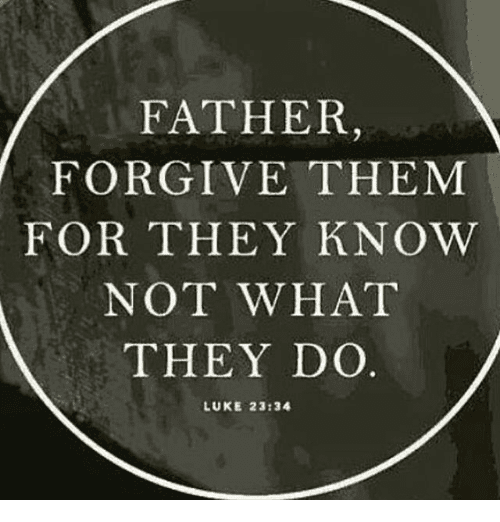 It was like He said, “Father, forgive them, for they need forgiveness so desperately… Forgive them, for they have committed a sin that is so wicked. Forgive them, for they have committed a sin that is pure evil, and they don’t even realize it. They were cut to the heart! The phrase means “to pierce” or “to stab,” and it has the image of something sudden and unexpected. Like it suddenly dawned on them that they had been responsible for the death of the Messiah, the one they had been waiting for for so long. The One they had longed for for centuries had finally come. But instead of welcoming Him and rejoicing with Him, they rejected Him and handed Him over to their bitter and hated enemies, the Romans, to have Him executed. As Jesus hung on that cross, the people responsible hurled insults at Him and mocked Him. I have to think that must have hurt Him as much as the nails. The people He came to save were mocking Him, insulting Him, being downright abusive toward Him. Yet, He prayed for their forgiveness. I want to suggest to you today that we can be that forgiving. We can truly love our enemies. We can truly forgive others that abuse us or treat us wrongly. We can reach out in love to those who seem so unlovable. The natural instinctive reaction is to give it right back to them, to harbor a grudge, ignore, complain, and walk away with a hardened heart. But we can choose to react differently. We can love, and we can forgive those who hurt us. The choice is yours. I encourage you to follow Jesus’ example. I encourage you to love and to forgive. I encourage you to be a person of love and forgiveness. That no matter what may come in the future, Jesus’ response may be your response. Father, Forgive them. They really don’t understand what they are doing.